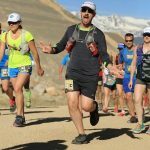 This is probably my favorite race in Colorado. 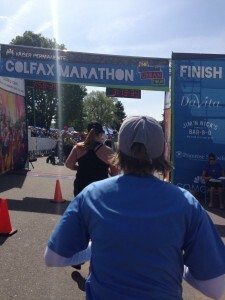 I have run either the half marathon or marathon Colfax race since 2008. The event encompasses the spirit of community in everything that it does. 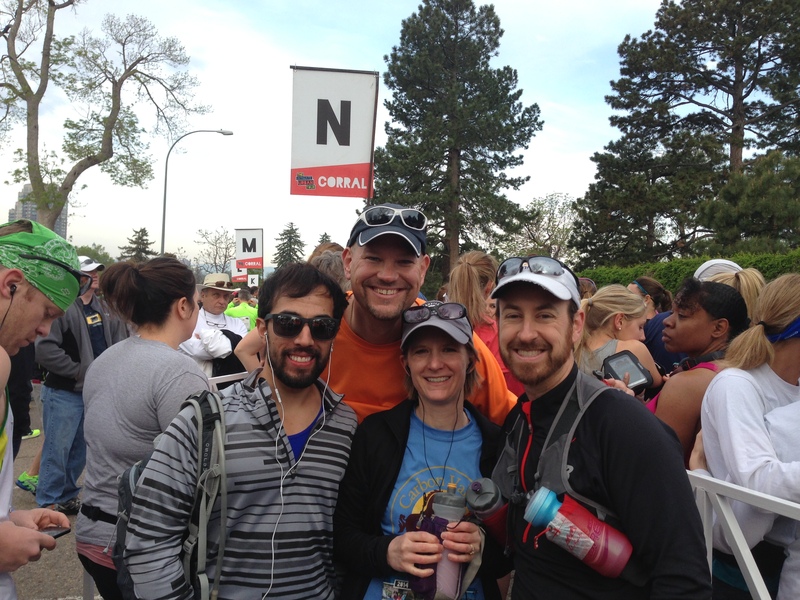 From the Expo weekend that takes place at Sports Authority Field at Mile High to the volunteers on the course to running through the Denver Zoo to the after party … it is about bringing people together. Some have run multiple races over decades and others this is their first event. 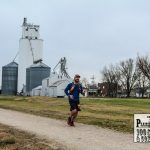 For many, a life-event caused them to lace up the running shoes … realization to get healthy, running away from addiction, or loss of a loved one. 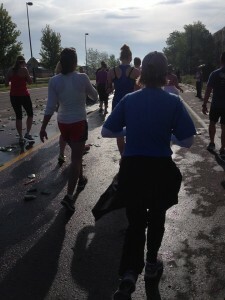 Thousands run the Colfax races for one of the 150+ charity organizations. Some are big and some are small local charities. All of them are focused on making a difference in an area that they are passionate about. 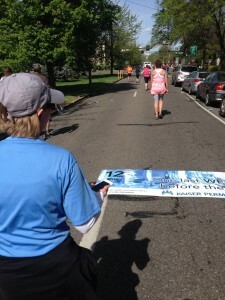 Colfax Marathon provides a platform for these organizations to create awareness and raise money. 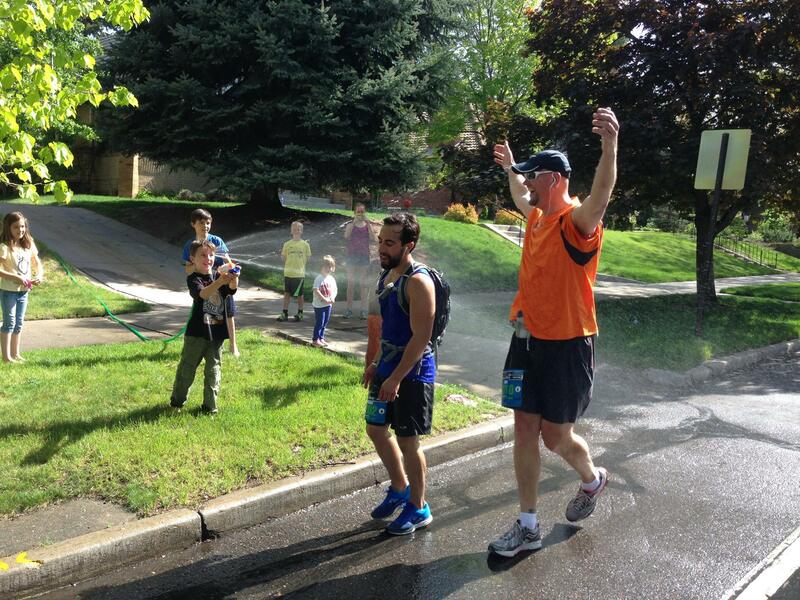 They create teams of runners to spread the word. My wife has not been a runner and has had no desire to be. In 2011, she came to Leadville with me as my crew chief for the Silver Rush 50. 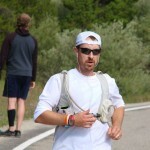 This was my first ultramarathon so I was winging it just as much. She is a planner, so wanted to know everything I needed at each aid station. I had no idea what I wanted. 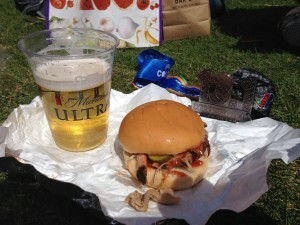 As I learned in future ultra races, this is normal. My wife thought it was all nuts. To my surprise, about 4 months ago, she made a comment that she may want to run the Colfax Half Marathon. 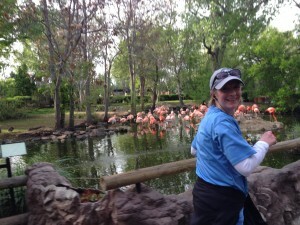 The idea of seeing if she can push herself to that distance and getting to run through the zoo intrigued her. I jumped on it and registered her, lined up a babysitter, and set forward in answering her questions. I was now her crew. 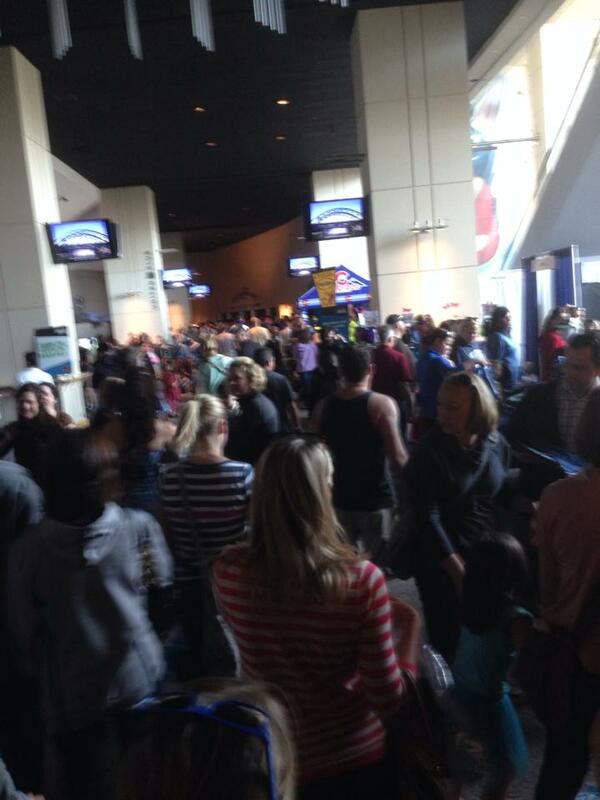 Fast-forward to race weekend … I was at the Expo starting Friday morning co-managing the sold out Relay Zone where 5,000 people would be coming through. 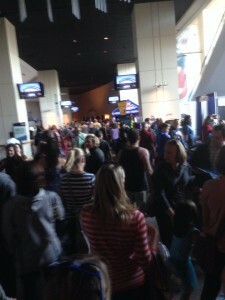 Some having very detailed questions to prepare for race day while others where in and out. It was 2 days of problem solving things like “I’m here to meet up with my relay team but I don’t know what they look like and don’t have their phone numbers so please help me.” No joke. Come Sunday morning and my legs, back, and arms were stiff. Alarm went off at 3:30am. Through the quiet of the house (unusual when you have 4 kids) we got dressed and headed out the door. We stopped to pickup Derek on the way and headed towards the Denver Zoo. 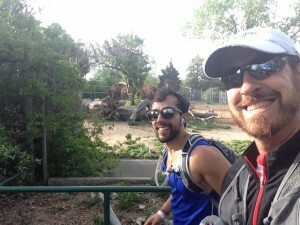 We were able to find a parking spot alongside the Denver Museum of Nature and Science which was less than a mile to the start. Before making it to the starting line, we ran into Mitch, who I co-managed the Expo Relay Zone with. 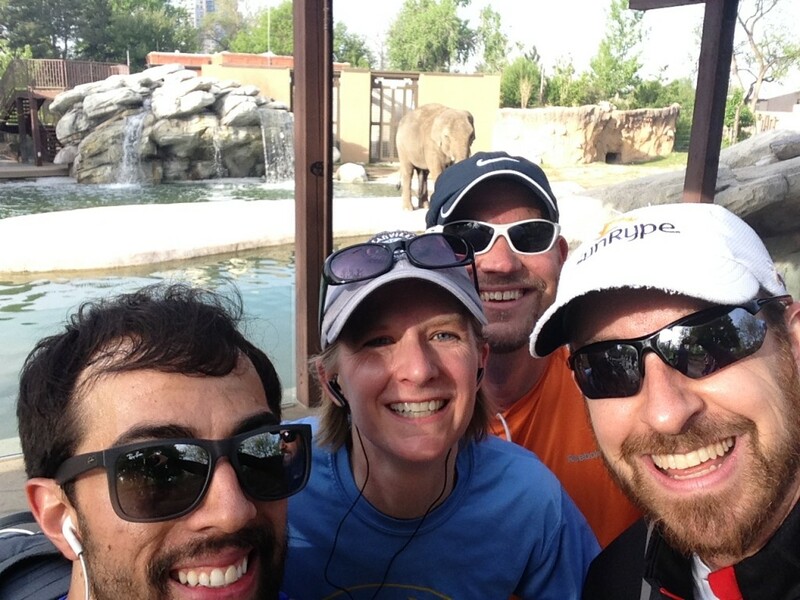 We chatted and headed towards the corrals. The morning spotlights led us to the coffee tent. There we ran into Carlos and several other runners we knew. 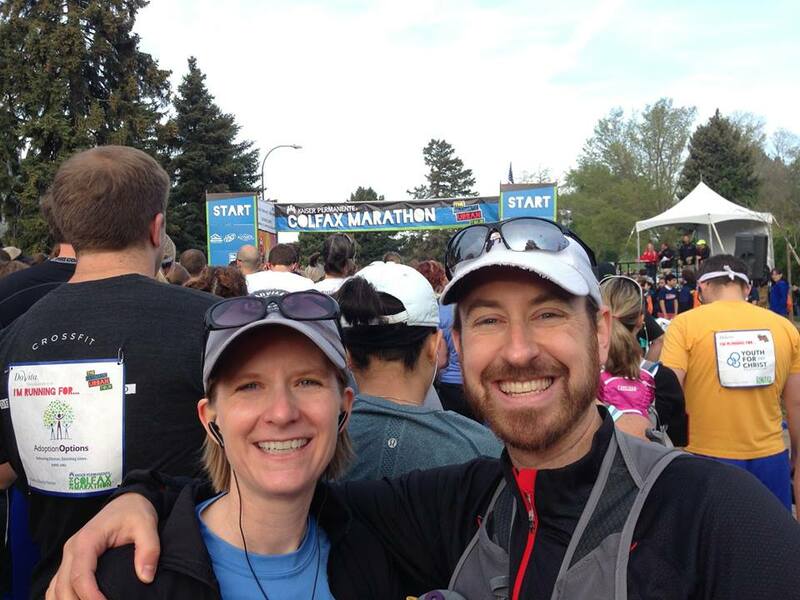 I introduced my wife to more and more people that were either running their first race or part of the Marathon Maniacs organization. The marathon race starts at 6am with the half marathon starting 45 minutes later. It was getting close for the marathon runners to take off, which means Jake Schroeder of the band Opie Gone Bad was up to sing the National Anthem. Really cool voice! After that, we headed over to bag check to drop off some extra layers and bottles. Said hello to Richard who was running Bag Check … after spending the last 3 days running the Expo where over 32,000 people came through! 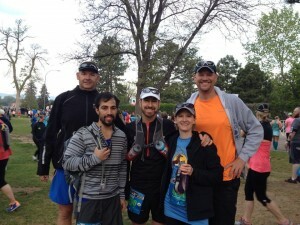 We reminisced on stories of the past couple days and headed over to our corral to lineup. Me: You’ll smell like that when we’re done. 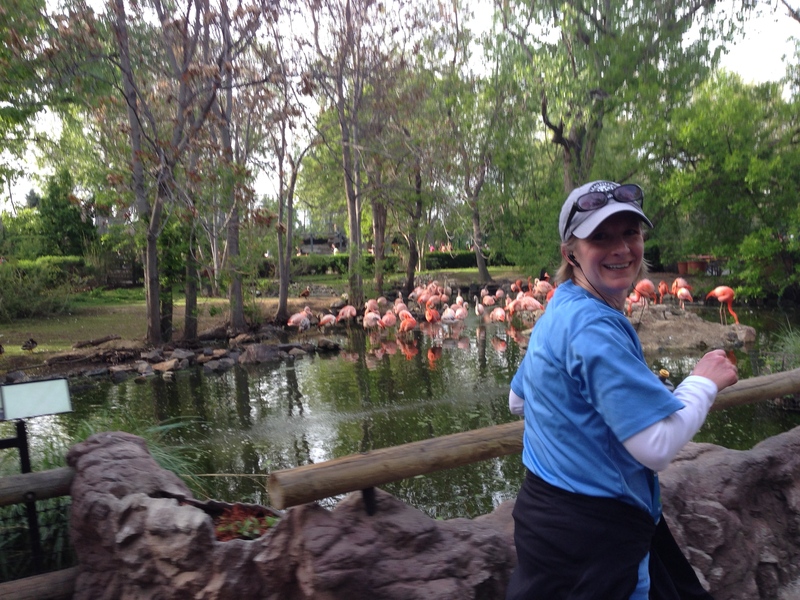 Entering the zoo at mile 2 you could hear animals making noise. Me: If you’re running on a trail and you hear those noises, you go the other way. Did you know that Cheetahs can run 70mph? Someone yelled why is that there??? I replied so that if they let the cheetahs loose don’t bother running! I make myself laugh at least. From there, it was a straight shot for a few miles. That can be a little more challenging as it seems like the road and crowd just keeps going on and on. Jim is a foot taller than me so he could see how much farther. Probably about 3 miles of doing this. Around mile 4 she was starting to battle. Music was helping but not going to last the entire time. We made a deal that she had to get 6.2 as that was her longest race to date. After that point, we would go to a run/walk strategy. When Jim and I are together, there’s no shortage of comedic material. The two of us have emcee’d an event or two together, so we have some chemistry. We both have the philosophy of having fun with life. It is usually around the 5 mile mark that the runners get quiet. There’s much less chatting amongst friends that came together as the warm-up period has ended. Between our air guitar playing, joke telling, and a little AC/DC dancing, Jim and I made up for the silence. Mile 6.2 came at the top of a hill. Me: You can’t walk now when you’re going downhill. Gravity is on your side! A short distance later, there was a live band playing some AC/DC. Jim and I did our best AC/DC one foot hop playing air guitar. Yup, we’re pretty damn cool. 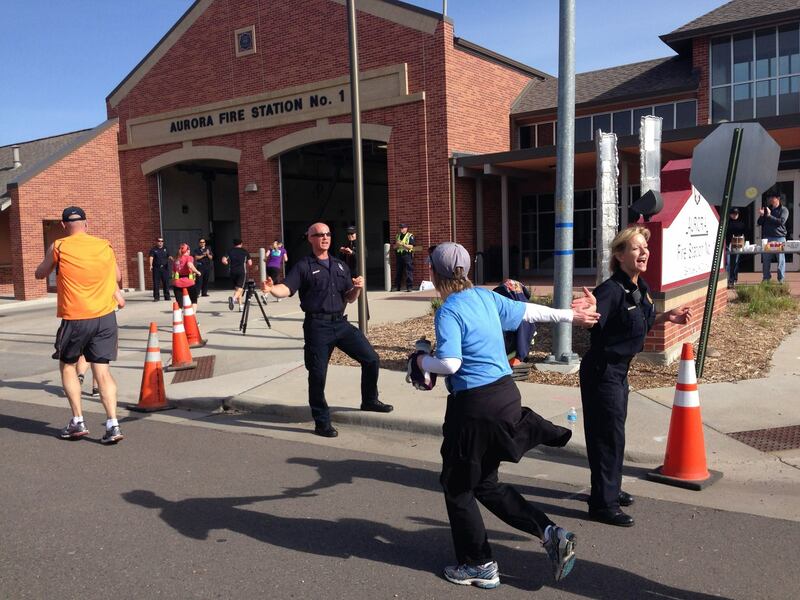 Mile 8 takes you through Fire Station No. 1 in Aurora. 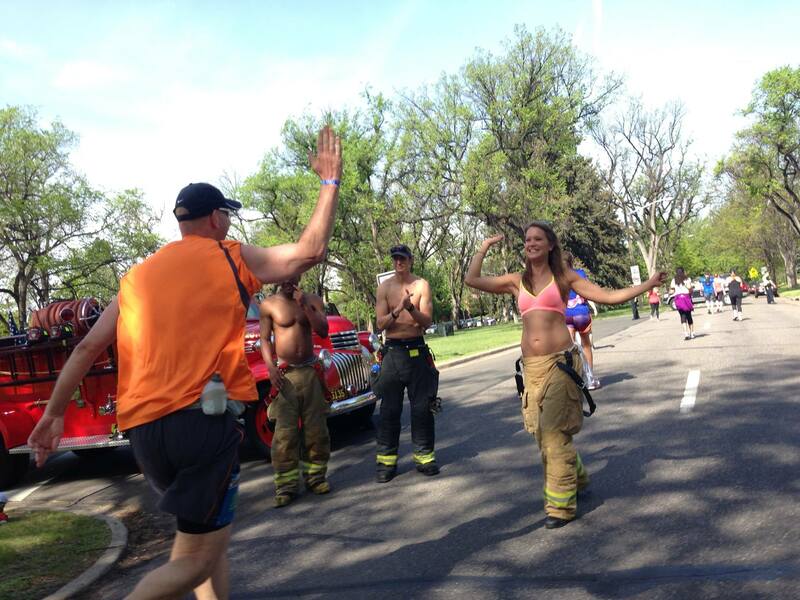 Very cool to have the firefighters lined up, giving high-fives, and shouting words of encouragement. Running inside and under a large American Flag was pretty special. Upon exiting the fire station, both sides of the drive were lined with motorcycle police officers. We thanked them as we ran by. We were on a little run/walk strategy. Run for 5 minutes, then walk for 1 minute, repeat. All was good. 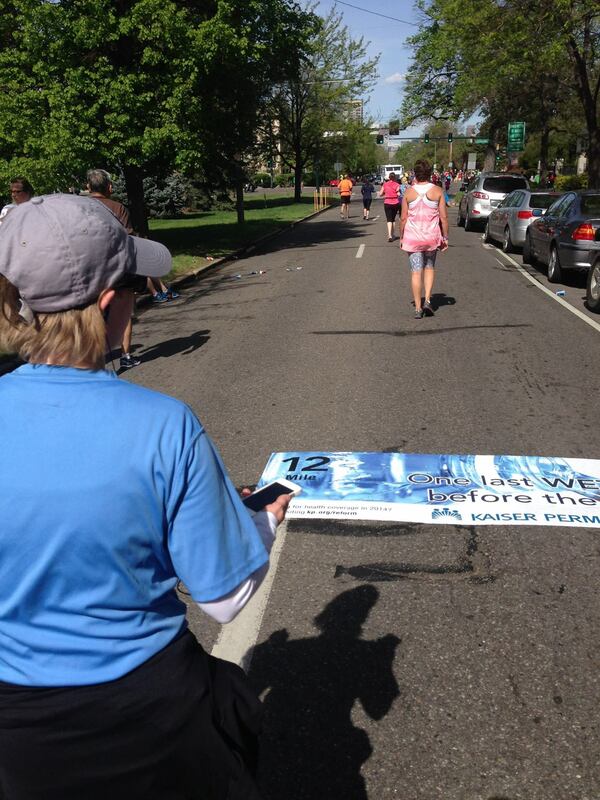 At the mile 12 mark we had a deal that we would run the last 1.1 mile all the way to the finish line. There were moments it was tough and the temperature had jumped 20 degrees since the start. We played the Spider Man game. This is a game I came up with when I paced my 9 year old on his first half marathon relay. It’s where Spider Man throws out his spidey web to a runner ahead and pulls them in. Try it sometimes when you need that little extra push. The neighborhood through this last mile is absolutely beautiful. Poking through the trees at the end of the road you could see the cash register building on the Denver skyline. It didn’t seem like it was getting much closer, but it was. Coming out of the neighborhood you could see the finish line. Having run this course before, I knew that it was not as close as you wanted thought at this point. Finish Line was a fun trick. As you are making the last turn you see an arch that says Colfax Marathon. We thought that was the finish line and started the last push. Funny thing is that the course leans to the right a bit as you approach that arch. Revealing the real finish line. It’s only another 800 feet or so, but throws the brain for a bit of a loop. The last push to finish was on and victory achieved! 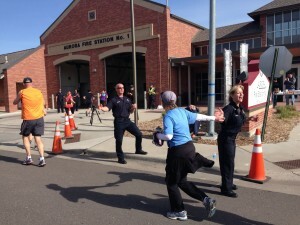 Firefighters were on hand to hang medals around the neck of finisher’s. 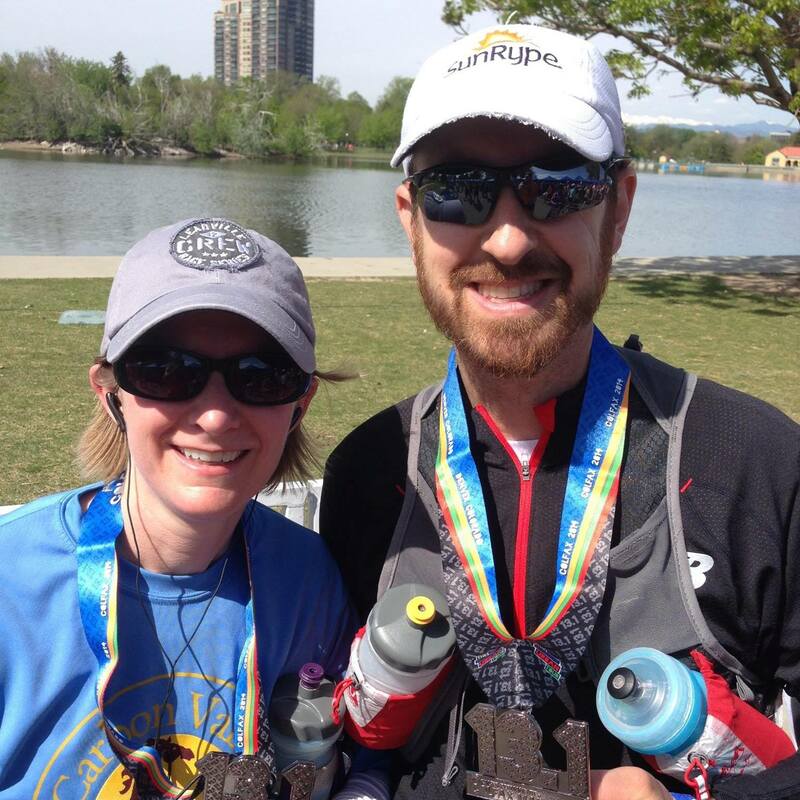 Very cool to see her get the half marathon medal she has been working for. She was a bit woozy so we made our way through the finisher’s area to grab some water and food. 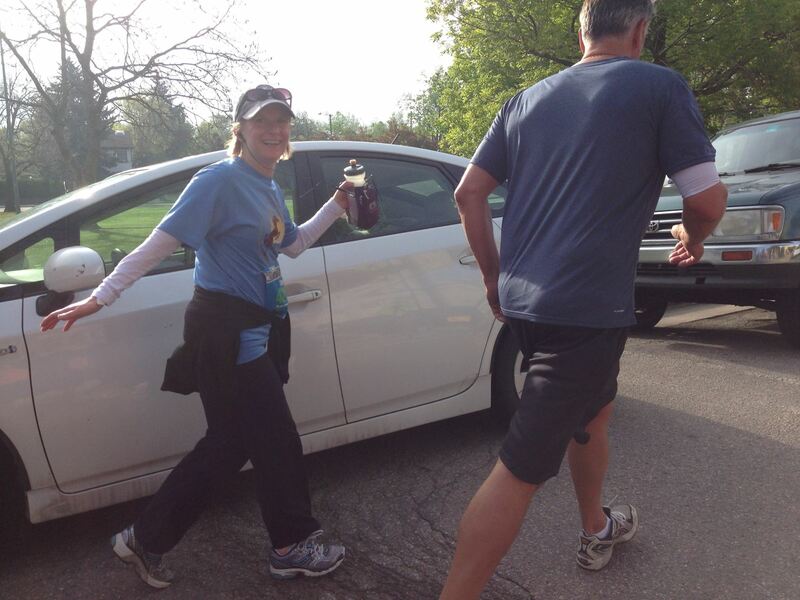 It was another great race experience and even more special because she pushed herself farther than ever before. Super proud!